Meeting with Sverdlovsk Region Governor Yevgeny Kuyvashev. Putin.BLOG Regions Meeting with Sverdlovsk Region Governor Yevgeny Kuyvashev. Vladimir Putin held a working meeting with Sverdlovsk Region Governor Yevgeny Kuyvashev to discuss road construction and the socioeconomic situation in the region. Before we go over the entire range of issues, I would like to ask you to report on the overall indicators. Let us start with road construction. Road construction has become a priority for the government. The regional road fund has accumulated 11 billion rubles. These resources were assigned by the road fund as per the regional programmes. Of course, the bulk of these regional allocations goes towards municipal roads. You have recently instructed us to redesign and improve the [Nizhny Tagil – Serebryanka] road, which until 2013 had not undergone any renovations for 30 years. Starting last year, we began allocating funds for this road, and let me assure you that the instructions you have issued following the news conference will be fully implemented in a timely manner. By June 1, we will make sure that this road is operational. However, we do need some more time to pave this 50-kilometre road. This road will be usable by June 1, just as you have instructed us. As for the key priorities in road construction, in 2013 we created a link between two regions that used to be isolated from one another. The so-called Northern Road now connects Sverdlovsk Region and Khanty-Mansi Autonomous Area, saving vehicles moving from the European part of the country to the northern part of Tyumen Region almost 800 kilometres. This resulted in higher cargo turnover in the northern areas. We are currently building the southern section of the Yekaterinburg Ring Road. In 2016, we launched the first section, and are now working on the second one that will be completed in 2018. Of course, we are eager to launch construction of the third section, which will complete the Yekaterinburg Ring Road. This is an essential route. In many cases, regional roads take on the role of federal routes. We are aware of that, and therefore invest in diverting road traffic from major cities. In keeping with your decisions on the implementation of priority projects, we will focus our attention on urban projects, including development and road construction in municipalities. Over 6 billion rubles have been allocated to our municipalities for road improvement in keeping with construction rules and standards. Road construction is a major issue that implies the flow of investment to all cities, including single-industry cities. We are implementing one such project in Krasnoturyinsk, which has the status of a priority development area. We know that investors will not take their money where there are no good roads. Therefore, the bulk of the development budget will be spent on roads. What is the overall figure for the region’s economic development in 2016? Mr. President, I have to say that growth has been reported in the leading sectors in 2016 and there is potential for further growth. I want to share some figures with you. The 2016 industrial production index (IPI) – we are still to finalise the figures but they will not change dramatically – has gone up by nearly 11.5 percent. As for gross regional product, we will maintain it at around the 2015 level, but the IPI accounts for 11 percent of GRP. These are impressive figures. Which sectors are responsible for this growth? The steel, mechanical engineering and defence sectors. We are making great strides in the development of our pharmaceutical and IT sectors. Yekaterinburg and Sverdlovsk Region comprise an education centre, which includes the Ural Federal University, but we are not focusing our efforts only on higher education. We are working to implement the comprehensive Urals Engineering School programme, which you approved in 2014. Allocations under this programme amounted to some 1 billion rubles in 2016, with 300 million rubles allocated from the federal budget and nearly 600 billion from the regional budget. Our organisations and companies are investing in this programme and are involved in its implementation. Vladimir Putin meeting with Sverdlovsk Region Governor Yevgeny Kuyvashev. 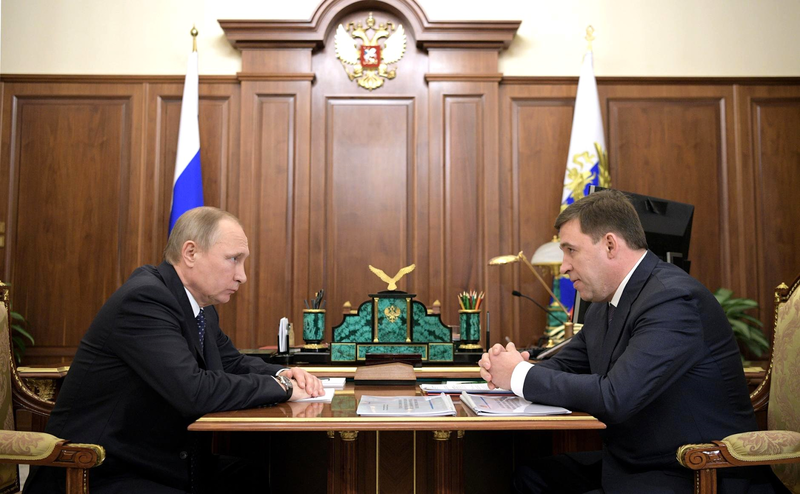 Putin with Sverdlovsk Region Governor Yevgeny Kuyvashev. 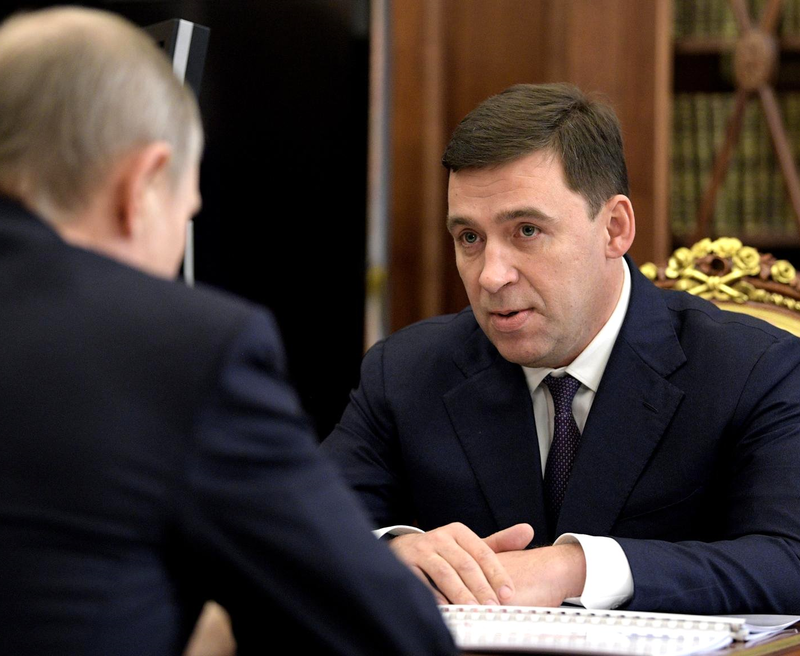 0 Comment to "Meeting with Sverdlovsk Region Governor Yevgeny Kuyvashev."